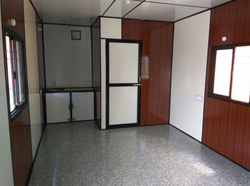 We are a leading manufacturer and supplier of impeccable range of Office Container such as Site Office, Portable Site Office, Prefabricated Site Office and Used Shipping Container. 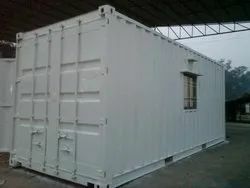 The offered office container is robustly designed and manufactured in compliance with set industry standards by utilizing high grade raw material and advance technology. In order to deliver flawless containers to our clients, these are thoroughly checked on various quality parameters by our quality controllers. Furthermore, we offer this office container in various specifications in terms of shape, size, dimension and can also be customized as per the precise requirement of client at reasonable prices. Our Office Cabins are modular and ideal for site offices / mini offices / office extensions. They are roomy and can also be used to store goods. These Portable Office Cabins are also water, termite and fire resistant. We are equipped with modern facilities to serve the very use of Office Environment. Our range of Portable Office Container has modular designed features combined with practical and well-furnished interiors ensure the highest levels of user satisfaction. These have well-built make to withstand critical temperature and weather conditions. The Office containers we supply are built with extra precaution under the watch full eyes of experienced professionals so that client sets trouble free operation. These are state of the art premium category Portable cabins for office use and can be transported with ease using flat bed trailers. The portacabins come ready with insulation,interior, electricals, flooring,windows and doors. These are good enough for usage on sites and factories also. Our Portable Container Office is essential for those customers who execute their work on different locations / sites. These cabins can be used as site offices, meeting chambers, workshops, medical-aid rooms, store cabins and even workshops. 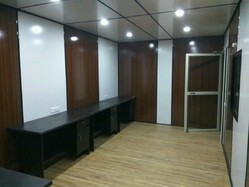 The Site Container Office we manufacture is as per the layout finalized by client and specifications confirmed. We take extra precaution to stick to finalized specifications and Layout. We are pioneer in manufacturing Portable Used Site Offices. Our architects also keep in mind proper ventilation for the interiors of these offices which are durable in quality. These Site Offices are very compact and have high structural strength thereby making it possible to create suitable sized enclosures. These are used Site Office which are manufactured using the Used Containers of sizes 20’x8’x8.5 ft, 40’x8’x8.5 ft & 40’x8’x9.5 ft.
We have recently launched a Portable Office solution of size 20x10x8.5 feet namely Portable Smartcabin to cater to the needs of low cost entry level Portable Office or Portable Labour room or Portable House. Our Portable Smartcabin are Modular and ideal for Site Offices/ Mini Offices/ Office extensions and Labour rooms as well as Housing. Our expertise lies in meeting the fabrication demand of mild steel based portable cabins. These are precision fabricated at our facilities using quality tested steel and we are duly welded to provide better stability. It comprises of entry doors & windows, self draining roof, base frame, peripheral structure as per the requirements. The Prefabricated Office we provide will last longer as we do antirust coating with zinc Based Primer and followed by two Coats of paint. We manufacture Portable Site Offices as per client’s requirements. These portable site offices are completely safe and easy to install. Also the construction being fixed type no professional labour is required to shift from one site to another. Well protected from inclement weather these cabins are secure. The Portable Site Offices we manufacture will come in ready to use condition. Container offices and bunkhouses cater to the needs of clients doing activities such as construction sites, road projects, housing projects, engineering projects etc. These offices have a large life of up to 20 years depending upon the maintenance & up-keep which varies from client to client. The Container Offices that we manufacturer come with lots of interesting features such as Rubber Gasket in doors, double door metal glass. We are the leading manufacturer of Modular Offices which are easily movable and shift able. Our portable cabins are fully insulated hence it protects from the outside temperature. 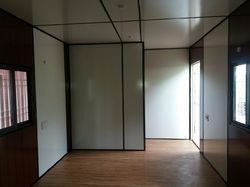 The Modular Office we are giving will come ready with electrical, flooring, insulation, Ply work, Windows and door. We manufacture export quality Portable Office Cabins that are widely used in for instant / store and as a live in site offices in remote areas. We use superior quality materials for the effective production of Containers based upon on international standards. 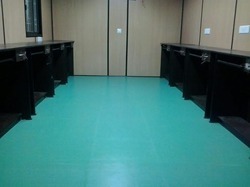 These site offices are provided with various numbers of partitions, toilet unit & other facilities. The Office Cabin provides an option to client from choosing in between variety of sizes and types and above all ready to use with in no time.